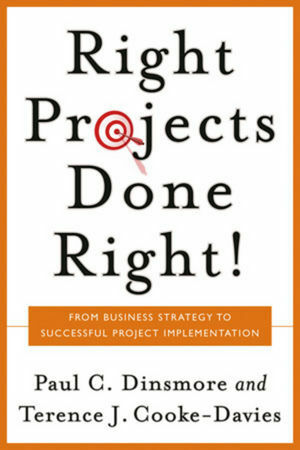 The Right Projects Done Right! reflects the advances that have been made since the concern for managing multiple projects in organizations first emerged more than a decade ago. This book includes findings and solutions that address three vital questions: Has the right portfolio of projects been chosen to ensure that company strategy is implemented successfully? Have the right projects with the right scope been selected as candidates for the portfolio? Are the projects managed well? Dinsmore and Cooke-Davies help managers answer these questions by providing them with the information they need to implement an enterprise-wide project management environment. Paul C. Dinsmore is an internationally renowned consultant, and Fellow and Project Management Professional of the Project Management Institute. A prolific writer, he is author and coauthor of numerous books, including Creating the Project Office from Jossey-Bass. Terence J. Cooke-Davies is founder of Human Systems, a company that creates and supports a global network of international organizations that work together to improve corporate performance through projects. He is a Fellow of the Association for Project Management and the Chartered Institute of Management. 1. Introduction: The Right Combination of the Right Projects Done Right. Part One: How to Manage Multiple Projects Successfully Throughout the Enterprise. 3. Factors Critical to Achieving Organizational Project Success. 4. Some Ways to Achieve Organizational Project Success. 5. The Management of Multiple Projects: Three Success Stories. Part Two: How to Make Sure Each Project Is the Right Project. 7. Selecting and Defining the Right Project. 8. Aligning Projects with Strategy. 10. Project Governance and the Critical Role of the Sponsor. 11. Organizational Change Projects and the Leadership Role of the Sponsor. 12. Successful Sponsorship: Two Case Studies. Part Three: How to Make Sure Each Project Is Done Right. 13. What Does It Take to Do the Project Right? 14. Stakeholders and the Complexity of the Human Dimension. 15. Doing It Differently: Variations in Project Management Practice in Different Industries. 16. Doing It Right: Development of a State-of-the-Art Methodology.